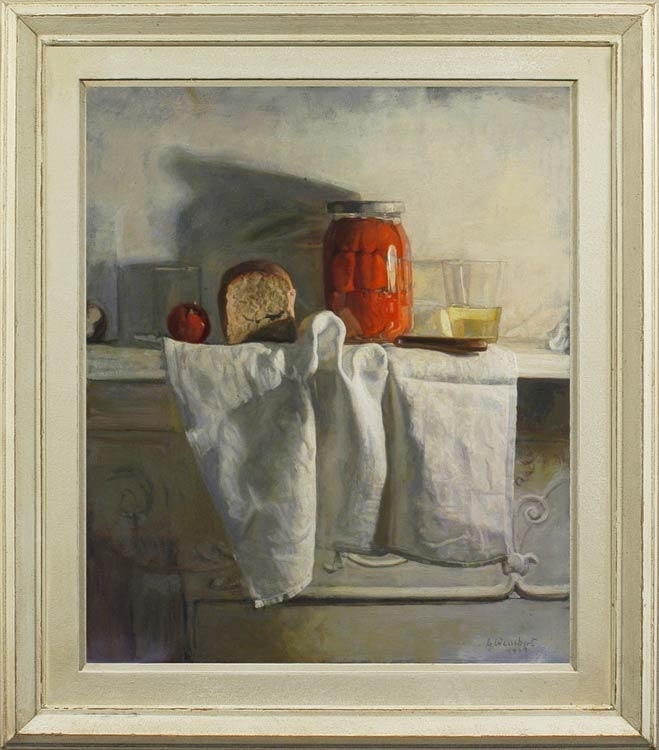 This is one of the most attractive of Weissbort’s still life paintings; an extraordinarily subtle harmony of neutral shades – the painted decorative shelf, the crumpled swathe of white linen, the pearl grey background, the transparent glass, the gentle fawns and browns of bread and knife handle: all animated by the intense glow of the off-centred red peppers and the balancing darker red of the tomato. He has painted a very plastic, three-dimensional study which is at the same time a carefully-composed pattern of abstract shapes, given added force by the restricted palette. This use in still life arrangements of neutrals lifted by one more vivid note is a reminiscent of the work of artists such as Giorgio Morandi (1890-1964), the father of the minimalist still life painting; William Nicholson; or Samuel Peploe.